I grew up watching my parents race, and when I was nine years old I decided I wanted to try it too. I immediately fell in love, and this is now my 9th season of mountain bike racing and my 10th season of cyclocross racing. 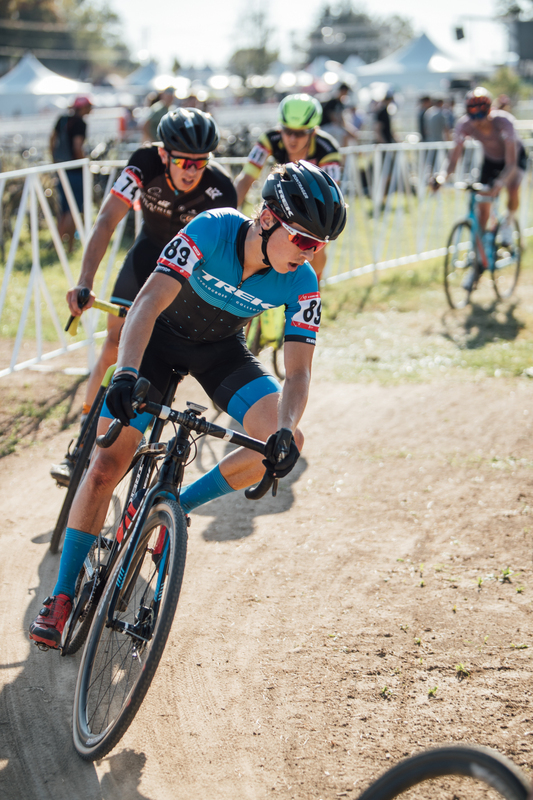 I race for Trek Cyclocross Collective. In cyclocross, my greatest accomplishment has been placing 32 in the 2017 World Championships in Bieles, Luxembourg. 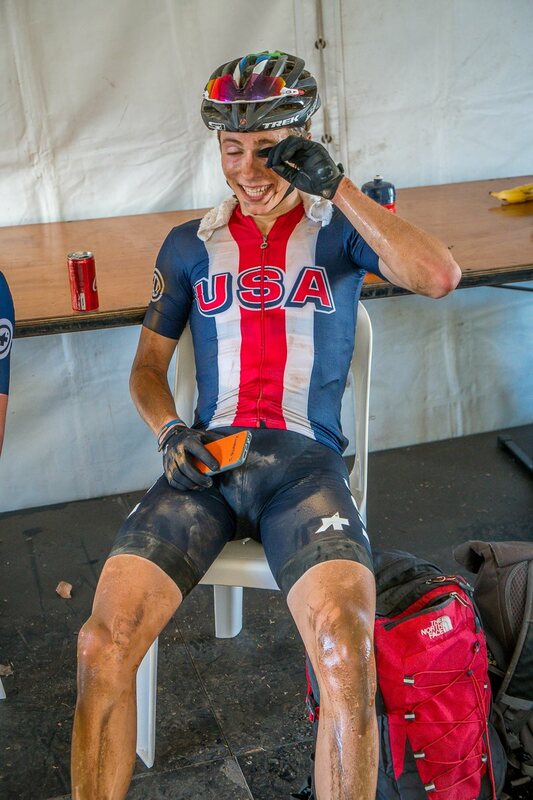 For mountain bike, winning the 2017 Mountain Bike National Championships 15-18 Short Track title. I greatly look up to my teammate and mentor Brian Matter. He has been racing mountain bikes professionally for almost 20 years and has taught me a lot about racing and training over the past few years. We also both love eating tacos and hitting jumps any time or place, so we get along well. What is your profession (if not your sport)? I am currently a student at Marian University in Indianapolis, studying biology and racing collegiately. -For mountain bike races I take a Stinger gel every lap, alternating caffeinated and non-caffeinated. -For cyclocross I take a non-caffeinated gel 15 minutes before the start and a caffeinated gel right before the start. -For training rides I like to change things up by bringing bars, waffles, gels and chews on longer rides so that I have options. -Keeping your training and racing fun is key to sustainability and success. -Foam rolling, stretching and compression socks are all extremely helpful for recovery, in addition to Honey Stinger Protein Bars and Mike’s Mix Endurance Recovery Drink . 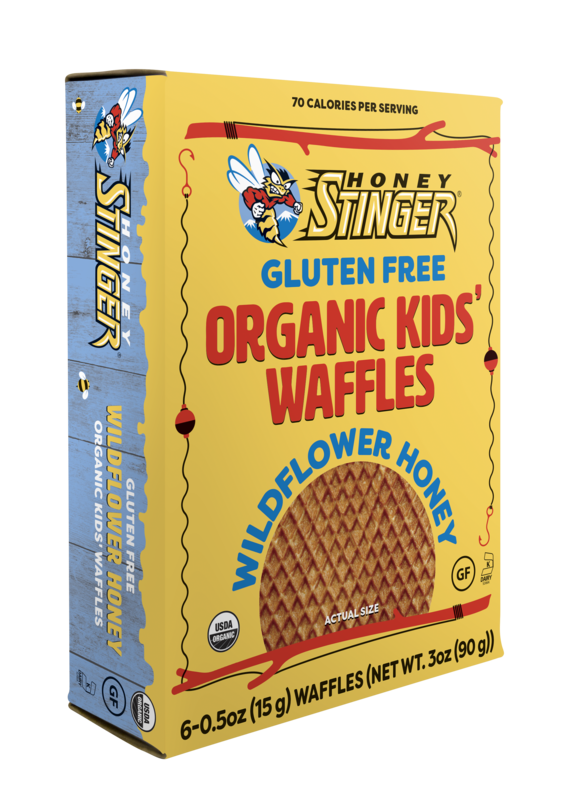 “We’ve built off of the sweet success of our Gluten Free Organic Waffles and created the perfect snack for kids, available in two delicious flavors: Wildflower Honey and Honey Cinnamon,” said Rich Hager, Honey Stinger co-owner. “Our Gluten Free Organic Kids’ Waffles are tailored to fit the nutritional needs of children. With 70 wholesome calories, these two thin waffles sandwiched by honey are perfect for kids on the move. Athletes from across the country headed to Steamboat Springs Aug. 12-13 for the two-day, 7th annual Steamboat Stinger. 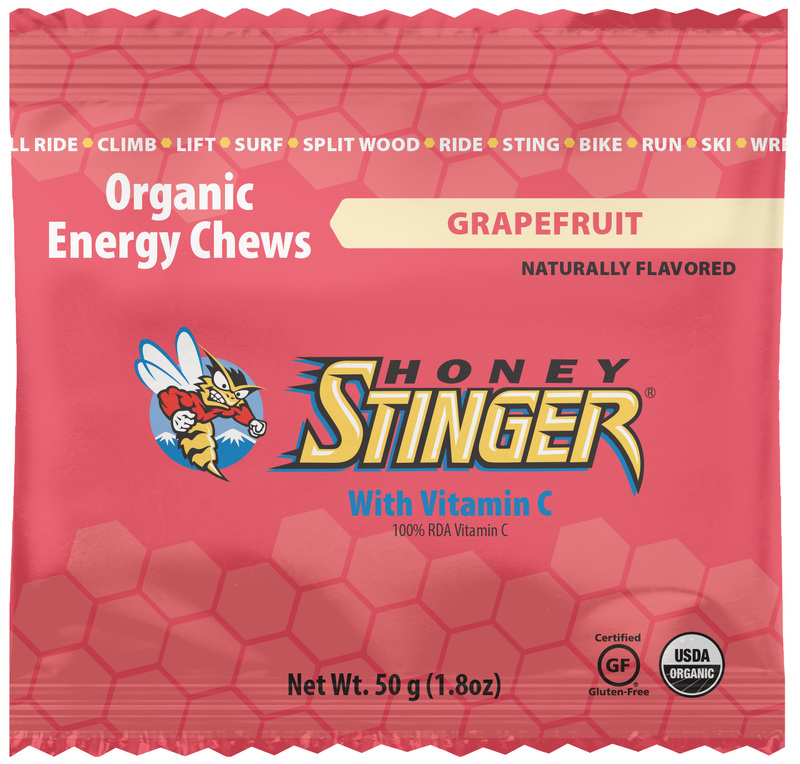 Honey Stinger, the leading manufacturer of honey-based nutritional products and founder of the event, hosted a 50+ mile individual and team mountain bike race, as well as full and half marathons. 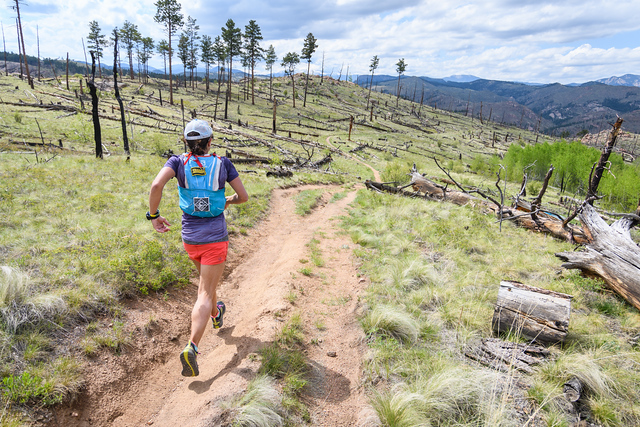 The scenic race course featured many crowd-favorite Emerald Mountain trails. This year, the trail race sold out for the first time and the mountain bike race saw over one-hundred additional participants than in years prior. 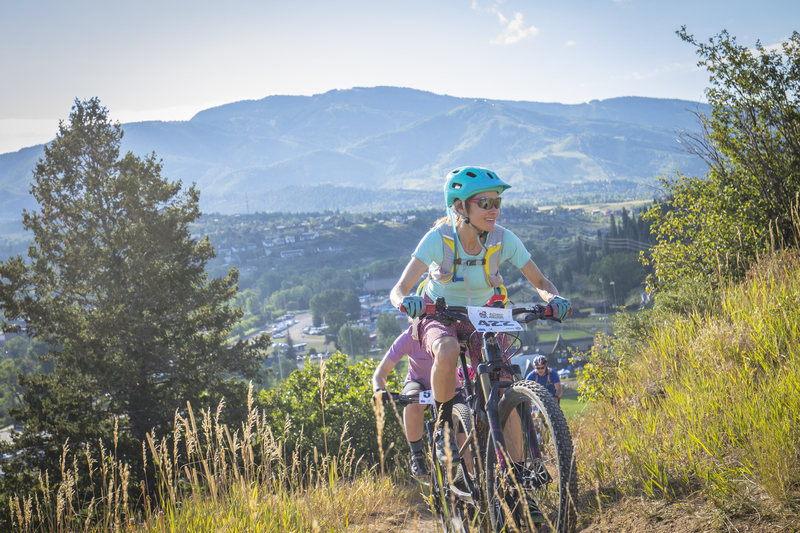 The morning of Aug. 12 started with a solo 50-mile mountain bike race, with Steamboat local Hannah Bingham placing first with a time of 4:42:52.0 in the women’s division. For the men, Chris Baddick of Boulder, Colorado, won with an impressive 4:05:35.4 time. The mountain bike course was composed of two 26.2 mile loops, all of which was on dirt and 90 percent of which was on flowing single track. 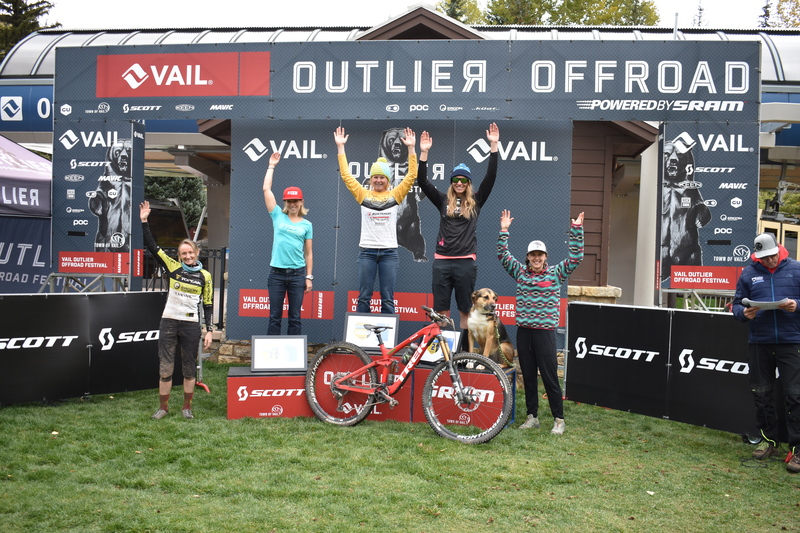 The Howland/Wong team from Avon, Colorado, took first place in the Duo Women’s mountain bike race with a time of 5:17:20.2, and in the Duo Men division, Honey Stinger Team rider McCalmon and partner Matheny achieved victory with a 4:16:53.6. The next day, a trail running half and full marathon took place on the same course as the mountain bike race. 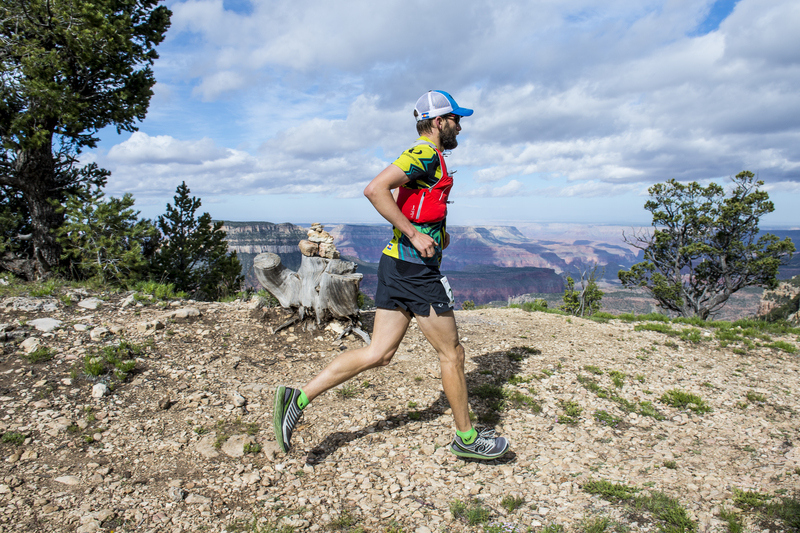 With a time of 3:10:18.79, Hive athlete Jared Bassett from Bend, Oregon, took first place in the full marathon. For the women, Julie Olsen from Parker, Colorado, finished first with a time of 4:01:03.45. In the half marathon, male Cale Allen, Denver, won with a time of 1:27:17.47 and female Sarah Pizzo, Hive athlete, placed first with a 1:38:33.05 time. The highlight of the iconic Steamboat Stinger weekend was crowning the winners of the King Sting and Queen Bee. The winners of that race had the fastest combined mountain bike and marathon times. 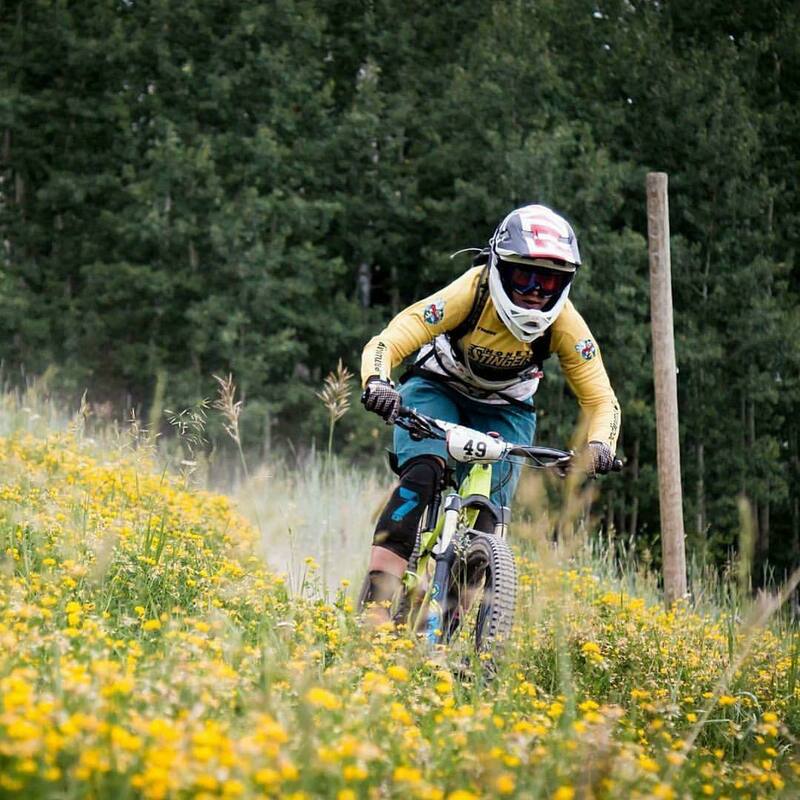 Jason Michalak of Crested Butte, Colorado, was crowned King Sting, completing both races in 8:51:40.95, and Honey Stinger Mountain Bike Team rider Liz Carrington of Durango, Colorado, was crowned Queen Bee, with a time of 10:45:58.23. 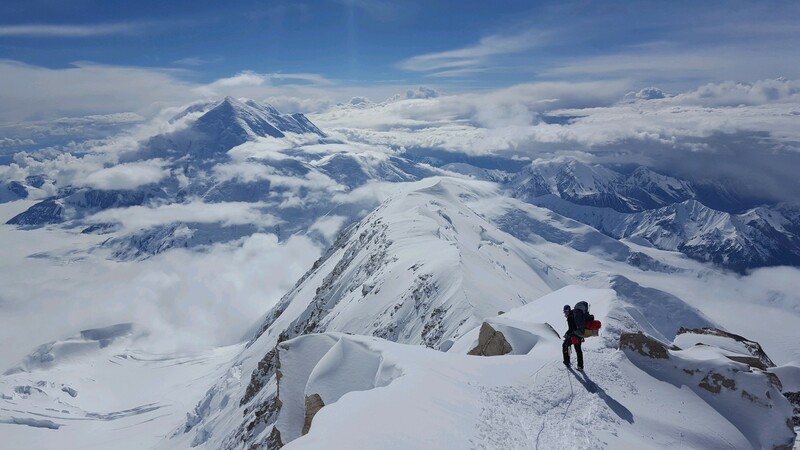 It was February of this year, when I received the text message, “This is a longshot, but do you want to join our team to climb Denali in June?” My heart immediately started pounding. This was a dream come true for me, and my answer was YES! The next few months were a whirlwind of training and gear hoarding. 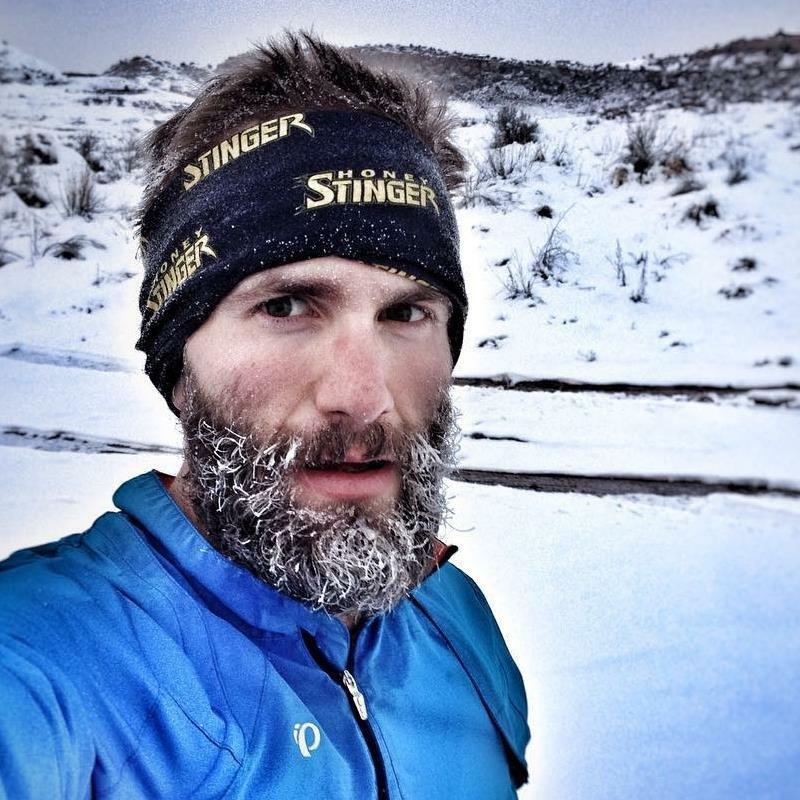 I’m a trail runner with some winter mountaineering experience; however, I had a lot to learn and needed a lot of gear. The mountaineering community was very generous! Denali Day 1, June 4th: We took off for Talkeetna, Alaska, with 830 pounds of gear in tow, boarding a single prop plane for our flight to the Kahiltna Glacier at 7,200’. 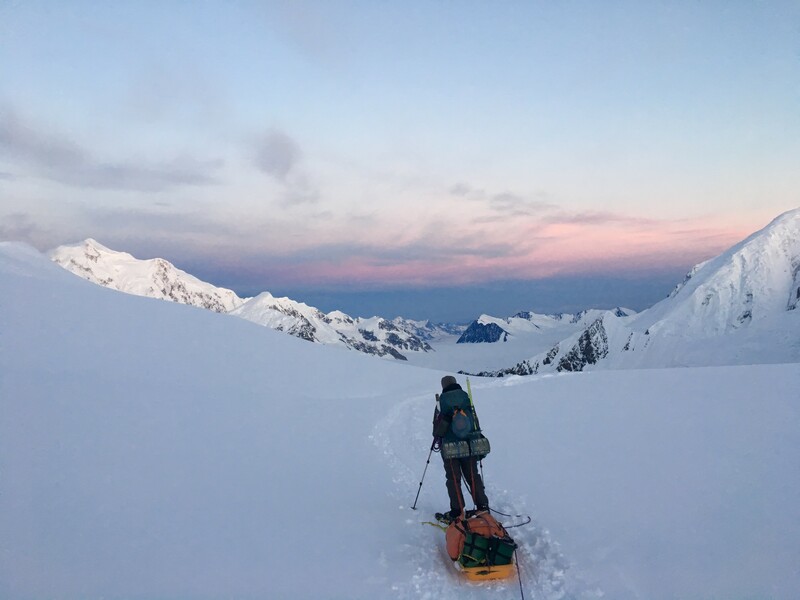 Upon arrival, we loaded up sleds and backpacks, strapped on our snowshoes, and started traveling. Our sleds and large backpacks made for an extremely heavy load! When we arrived at camp at 7,800’, we noticed a helicopter flying in. We were later informed that the helicopter was in the middle of a crevasse rescue, taking 15 hours to rescue a man that had fallen 60’ down. An air chisel and blow torch were needed to free him, and he was lucky to survive! Denali Days 2-11, June 5th-14th: Over the next several days, we methodically moved our way up the mountain from 10,200’ camp to 11,000’ camp, and then up to 14,000’ camp. We climbed Motorcycle Hill, Squirrel Hill, Windy Corner, and encountered many crevasses. Although the days were long and difficult, I was always in awe of the beauty around us. At 14,000’ the sky opened up to amazing views of Mount Foraker and Hunter and the surrounding peaks. We could see the different routes up Denali, including the West Buttress Route we intended to climb. Reaching camp at 17,000’ our backpacks were very heavy with all of our summit gear, but I was stoked. Despite a bit of altitude sickness, this was the highest I’d ever been! Denali Day 12, June 15th: Summit Day…..We waited for the weather to subside, but the wind failed to die down. Half of our team was leading the way ahead of us when, near Denali Pass, the wind was so bad they had to turn around. We all hiked back to camp together at 17,000′ and settled in, with the wind whipping and the temperature dropping to -20 degrees. The next morning we learned that a team of 3 from Nepal made it to the summit. On the way down, one of them collapsed 6 minutes from our camp and died. He was only 28 years old, and Denali would have been his 7th of the Seven Summits. He paid the ultimate price! Denali Day 13, June 16th: The next morning we woke to snow and to teams packing up to head down in low visibility, so we joined them and climbed down to 14,000′ to evaluate our situation. The forecast wasn’t looking good for the next several days, and we heard that the crevasses were opening up down below. The decision was eventually made, we would pack up camp and head down the mountain in one push. 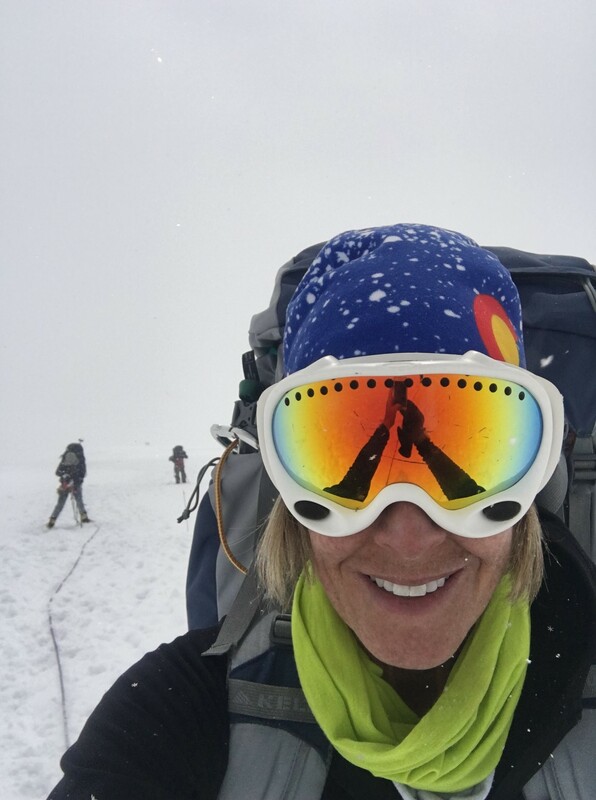 Denali Day 16, June 18th: I felt torn about leaving without our summit – we all did. For two on our team, this was their second attempt. But with the threatening forecast on the horizon, we packed up and left 14,000’ on Sunday afternoon and hiked all night to get back to Base Camp around 5:45am. We were on our way back to civilization, and a hot shower sounded so good!!! Denali was an absolutely amazing experience! I was blown away by its beauty and humbled by its fury. I realize now that it’s not always about the summit but about the experience and friendships you make along the way. I will always cherish this experience and the things the mountain taught me. Hopefully, I will have the opportunity to return to Denali someday. Until then, I’ll be exploring and climbing new summits! Happy 100th Anniversary, Denali! *The summit success rate was 31% for the season, when we left Denali. We are excited to introduce new bulk containers for select flavors of our Organic and Classic energy gels. The new bulk gel containers make it easy for athletes and coaches to measure the exact amount of gel to use for training and racing. The Organic Fruit Smoothie, Organic Acai Pomegran ate, and the Classic Gold flavor will be available for purchase in 23.1 ounce bottles. The energy gel containers will be available for purchase starting this September for $18.95. Honey Stinger Organic Energy Gels are available in six flavors: Fruit Smoothie, Acai Pomegranate, Vanilla, Mango Orange, Caffeinated Chocolate and Caffeinated Strawberry Kiwi, and are comprised of a blend of organic tapioca syrup, organic honey, and electrolytes (sodium and potassium) in individual 1.1 ounce packets. 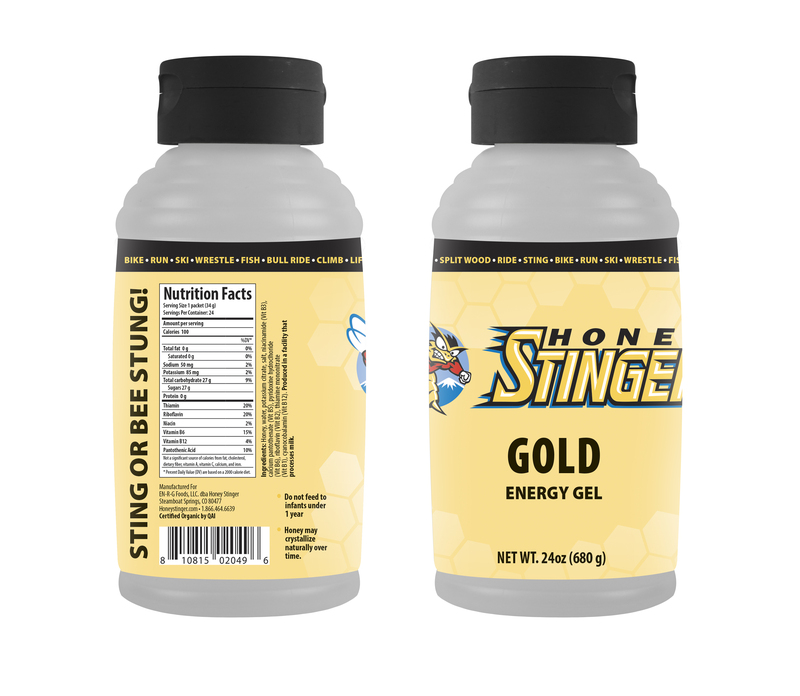 Honey Stinger Classic Energy Gels are comprised of pure honey, electrolytes, sodium, potassium, and B complex vitamins in Gold and Ginsting flavors, in 1.1 ounce packets. When I first got stung by the triathlon bug, I probably weighed 270+. I’d stopped counting. I had gained weight throughout a difficult, long relationship and was eager to get back to the fit weightlifting, skiing, tennis playing lifestyle that I had let slowly slip away. 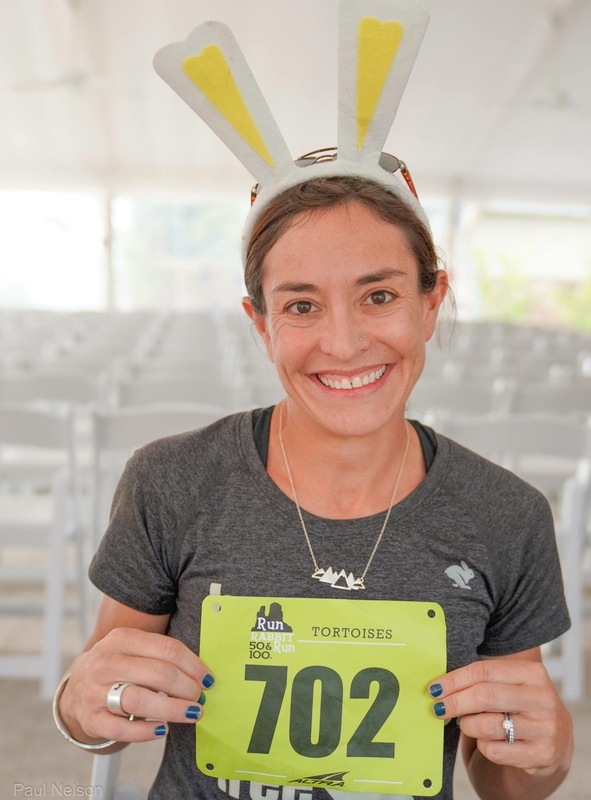 Once I got my first sweet taste of racing at the Falmouth Spring Triathlon on Cape Code in 2009, where I surprised myself by earning 3rd Athena (I’d never won anything in my life), there was no turning back. Well, qualifying for the Boston Marathon as an Athena was very special. But, having the support of my family and friends at each of the national championships events I have competed in has been precious. I have now won seven USAT National Champion titles in triathlon, one in the sprint distance, five in the Olympic distance, and one in the half iron distance. I’m a purist. Honey Stinger Gold Gel only and always. When do you use your Stinger? Have you tried it on toast? Divine. Person or athlete you look up to? Wow. So many, Simone Biles, Serena Williams, Misty Copeland, Simone Manuel, Debi Thomas. They each rose to the top of their respective fields in sports where minorities have not traditionally had a presence. 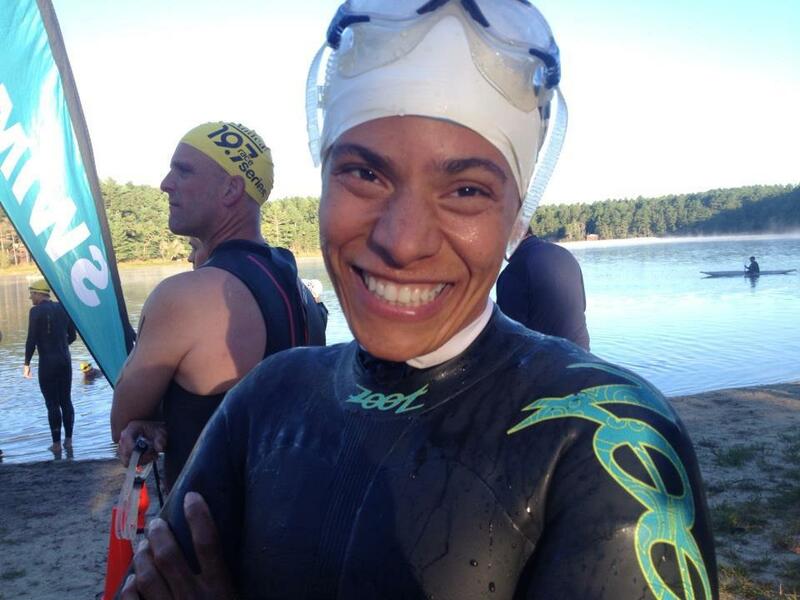 I take my role as the creator of the “Athena Triathletes (& Athena Alumna)” Facebook page seriously. 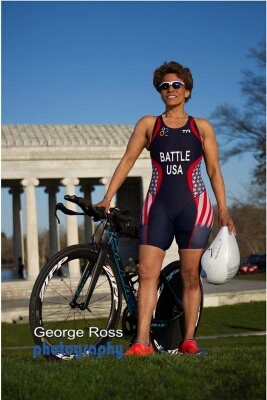 It is a group designed for female triathletes weighing no fewer than 165 pounds. I believe we have created a unique space where athletes of like life experiences can come together to support and learn from one another. I turned to Facebook to build a sense of community and support among the Athena athletes I was competing against…collecting their names at races from results boards like a bee gathering pollen to return to its hive. The group has blossomed to nearly 2,000 members. Finding one’s collective, one’s cooperative brood is extremely important for women who are not perceived as your typical athlete. We are dedicated to improving opportunities for recognition of Athena athletes as a competitive class, as well as to shattering misconceptions in perception of the comparative abilities of Athena athletes. To do my part to advance the regard and participation levels of Athena triathletes. 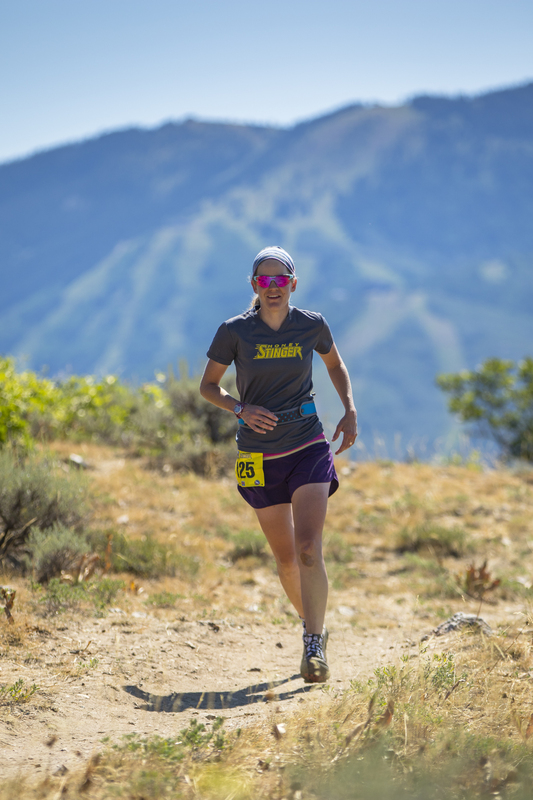 I am on the Altra Global Endurance Team, Pyllon Racing Team , and am an ambassador for Swiftwick Socks, in addition to being part of the Honey Stinger Hive. How did you get into the MUT running? I fell in love with the mountains through hiking, mountaineering, and backpacking. Slowly I came to the realization that if I left all the heavy stuff behind I could run in the same places and see a ton more in a day. In 2013 I paced a friend of a friend at the Leadville 100, got hooked and ran my first 100 miler at the Grand Mesa 100 the next year. Climbing Mount Rainier in a day. At the time, I didn’t realize ho w everything came together to make it happen or how fit I was – which tends to happen when you are just following the fun. 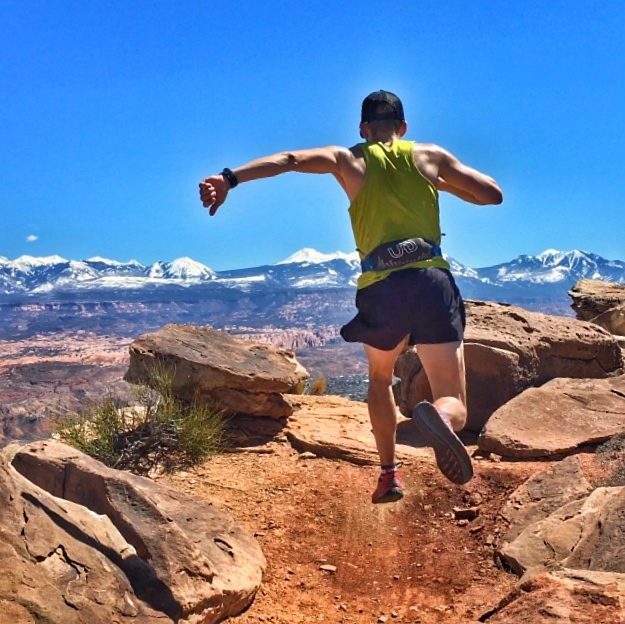 To run healthy, to run mindfully, and to continue to push myself to see what I’m capable of. When do you typically use your Stinger? I usually consume 5-6 chews or one gel every 45 minutes – 1 hour during competition. Take the time to be with the people and to do activities that you miss out on during intense training blocks. Pulling off my first dead toe nail. Now it’s odd if I have all ten on any given day. I have played African and Latin drums for much of my life and although I no longer perform or practice regularly, I tap out rhythms all day long. We are excited to announce the addition of new positions across our sales and marketing divisions in order to accommodate the company’s growing business. Patrick Leslie will fill the role of east coast regional account manager for grocery, Erin Ross will manage inside grocery sales, Abbie Durkee will become the new northern California field representative, Shannon Grasser will manage eCommerce, promotional, and athletic program sales, Mac Kelly will manage sales for collegiate and high school athletic programs, Kirsten Tidik will become a seasonal marketing event representative, and Jason Stephen will join the team as the new customer service & sales support representative. Bringing 20 years of experience in the bike industry and outside sales, Leslie will be responsible for managing and growing the eastern U.S. grocery business for Honey Stinger. Ross will transition to inside grocery sales from her former position as customer support specialist, where she will manage all current independent grocery accounts along with new business in that category. 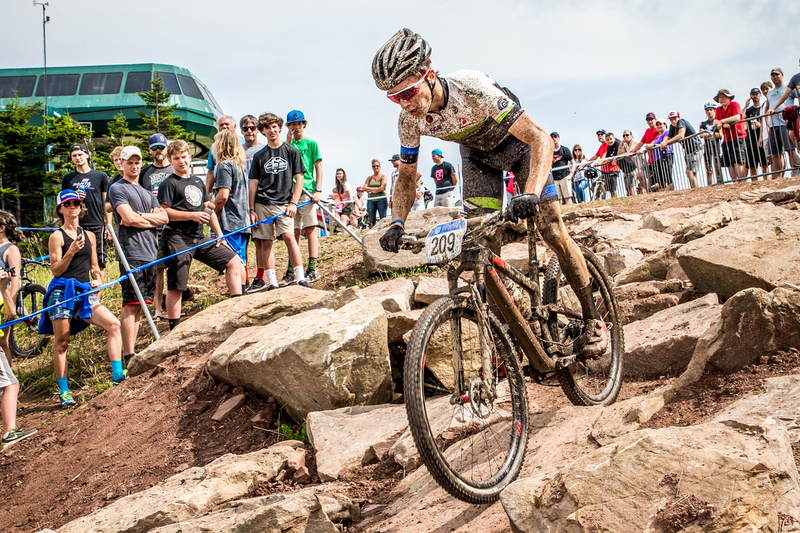 Former professional mountain bike racer and Honey Stinger Hive athlete Durkee will assume the role of northern California field representative. Moving from key accounts and collegiate sales, Grasser will manage a newly created department and team, overseeing the eCommerce business, including direct website and promotional sales, college athletic programs, and new business. Kelly joins the team from Honey Stinger’s sister company, Big Agnes, where he previously served on the customer service team. Kelly will manage collegiate and high school athletic program sales to increase sales and brand presence within college and high school athletic programs. Transitioning from independent grocery sales, Tidik will take on a role as a seasonal marketing event representative to boost sales and brand awareness at tradeshows, clinics and sampling, as well as assisting with the organization of the Steamboat Stinger races, and all other sales and marketing events. Finally, Stephen will relocate to the Yampa Valley from Beaver Creek for his new position as customer service & sales support representative.